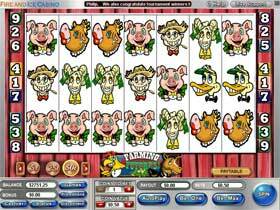 You'll have loads of fun playing this 9 pay-line, 7-reel video slot game. In farming futures you can pick a variety of coin and bill denominations. Coin wagers include pennies, nickels, quarters and half-dollars, while bill wagers include $1, $5 and $10 coins. The symbols consist of a farmer, pig, mule, hen, cow and ram. There is no bonus round in this game, however, unlike many video slots it pays for both right to left and left to right combinations. Another great feature is that 2 of the reel symbols only require 2 to stop on a covered pay-line for a win. In addition, 2, 3 or more symbols can stop anywhere on a covered pay-line for a win as long as they are next to each other or in a row. This allows for wins on almost every spin.